These are the teacher reference books that I always have in my classroom and refer to often. It is a very eclectic collection I know. There are books to help your drawing, reference books to promote that fact that I don't know everything but I do know how to find out, books to promote thinking, books containing the thoughts of great people and books that will help you answer questions. 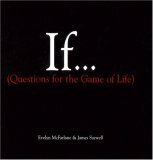 If...(Questions For The Game of Life) - If you ever have a spare 5 minutes propose one a couple of these questions (make sure you edit them) and have the children answer them in pairs and share with the class. Heaps of fun! Mind Maps for Kids - mind mapping is an essential skill for teachers and students. Be sure you know why and the conventions of producing them. The Oxford Dictionary of English Etymology - So when and where was the word 'elbow' first used? What about 'zipper'? My point to the students is that our language comes to us and each word has a history. Let's find out a bit about some of them. Primary Maths Dictionary - When faced with a piece of Maths terminology that the students don't remember or have not encountered I encourage that thier first port of call is a Math Dictionary. It takes a while to get this to habit level but will save you heaps of time and produce independent learners. How To Have A Beautiful Mind - over the course of the year pick this one up every now and then and implement some of the ideas. Oxford Atlas of the World - I love Google Earth and use it all the time in class but I also teach how to use an atlas to find places. The Oxford Dictionary of Quotations - 'I am not yet young enough to think that I know everything' :) I love getting students to look up what people throughout history have said about a certain concept. This can promote some pretty deep thinking.